Earth–Moon–Earth communication (EME), also known as moon bounce, is a radio communications technique that relies on the propagation of radio waves from an Earth-based transmitter directed via reflection from the surface of the Moon back to an Earth-based receiver. 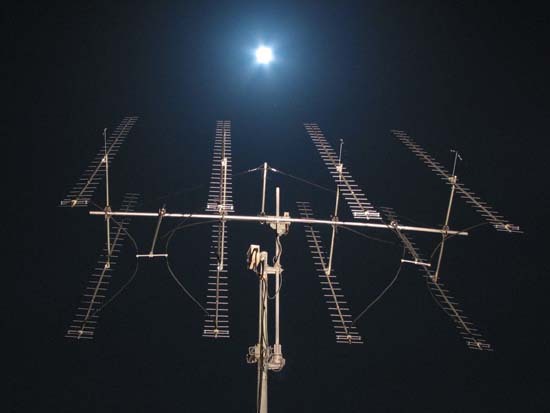 Amateur radio (ham) operators utilize EME for two-way communications. EME presents significant challenges to amateur operators interested in working weak signal communications. Currently, EME provides the longest communications path any two stations on Earth can utilize for bi-directional communications. Amateur operations use VHF, UHF and microwave frequencies. All amateur frequency bands from 50 MHz to 47 GHz have been used successfully, but most EME communications are on the 2 meter, 70-centimeter, or 23-centimeter bands. Common modulation modes utilized by amateurs are continuous wave with Morse Code, digital (JT65) and when the link budgets allow, voice. Recent advances in digital signal processing have allowed EME contacts, admittedly with low data rate, to take place with powers in the order of 100 Watts and a single Yagi antenna.